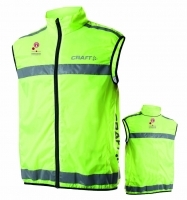 Reflective vest with good breathability. For training at night, Reflective front and rear. Mesh back for optimum ventilation. Reflective piping and logos . Closely woven micro polyester with very good wind protection and ventilation.